1) All type machining - Milling , turning , Boring , Drilling . 2) All types casting forgings . Establish In-House / commercial LAB for physic-chemical and Microbiological Test as per Industry requirement. Standardize the testing methods as per product, Train Laboratory staff as per Standard norms. (Vis. ISI. ASTA, AOAC, BAM, USP, BP, IP) Taking contract of Quality testing & run in-house lab under our well experience staff observation. training to use embroidery design software . and also blouse embroidery training using single head machine . We are the most trusted organization for providing practical knowledge oriented training on Robotics, PCB Designing and various micro-controllers like 8051, ARM7, ARM9 etc. Circuit training is an excellent way to improve fitness and strength. It is traditionally a set of aerobic and strength exercises carried out at sports hall or somewhere else. 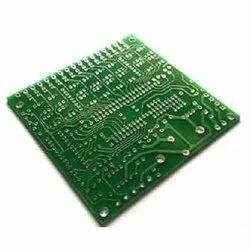 For any electronics product, printed circuit board (PCB) forms the basic foundation for interconnecting and packaging. PCBs are used to mechanically support and electrically connect electronic components using conductive pathways, tracks or signal traces etched from copper sheets laminated on a non-conductive substrate.